Only, the only thing in the room that was burned was the wicker chair in which Ms. Carpenter had seen Mary Reeser in the night before when she came to say good night. The 170 pound woman had been reduced to nothing more than ten pounds of ash and only her one leg remained unburned. Nothing else in the room was burned though it did show signs of extreme heat. Candles were burned and electrical wires were melted. A mirror was cracked and the walls were covered by greasy soot. Her clock had stopped at 4:20am when the heat from the fire melted the plastic wall socket. To date, this seems to be the best documented case of spontaneous human combustion. Although the police closed the case, the investigators kept saying that very few of the facts made sense. There are very little facts to explain this phenomenon and others of its kind, even though spontaneous human combustion has been documented as early as the 1400s. Personally, I cannot even begin to think of a reason why this should happen – but, I still find the cases fascinating. For this week, I’ve decided to introduce you to a mystery that I only recently learned about. It’s the story of Zana the Wild Woman of Abkhazia. In the 1880’s, a group of people managed to capture a wild woman who had been living in the surrounding forests. Hunters managed to subdue her, though she fought like a wild animal and eventually had to be beaten into submission after which she was bound, gagged and displayed in a cage. After some time, a visiting nobleman bought her and took her to his estates where she had to stay in an enclosure for the first couple of years. It was clear from the start that she wasn’t a ‘normal’ human. She was stronger than any man alive, she hated heat and preferred to sleep outdoors (completely naked) even in the winter, she had deep brown skin, thick reddish hair that covered her whole body, red tinged eyes, long hair which hung down her back in a tangled mane and a flat broad face. By all accounts, she looked like a Neanderthal. She was later freed, or rather allowed to roam around the village though she kept returning to her enclosure where she had been fed. When provoked, she reacted like a wild animal, baring her teeth and snarling at whomever did the provoking. It was only after some time that she showed some measure of intelligence, though she never learned to speak. She was taught to perform basic tasks like grinding flower and cutting logs. She had a lot stamina and could run as fast as a horse. She bore several children during her years at the nobleman’s estates, though most died because she tried to bathe th `em in the cold river. The villages managed to take her children from her after it became clear that she couldn’t raise them herself. They managed to raise two sons and two daughters, who grew up as ‘normal’ humans though they did bare some resemblance to her and had ‘mental difficulties’ such as quick tempers and occasional reckless behavior. Throughout her live, Zana didn’t show any signs of aging. Her features is said just to have remained unchanged until she died. She was buried in the family cemetery and her two youngest children were raised by the nobleman’s wife though they were never given the nobleman’s name. Her youngest child Khwit died in 1954 and was also taken to the family plot. Despite the fact that Zana lived in the age where photography was already practiced, there are no photos of her, though the scientists who had originally investigated the story spoke to a lot of witnesses who had firsthand accounts of their encounters with her. Her children had mostly moved away from the region and raised families of their own. In 1964 two archaeologists, V.S. Orelkin and Boris Porshnev attempted to find her grave. Though unsuccessful they did find the one of her youngest son Khwit. His skull was studied by fellow anthropologists and indicated clear ‘paleoanthropic’ features. The skull discloses a great deal of peculiarity, a certain disharmony disequilibrium in its features, very large dimensions of the facial skeleton, increased development of the contour of the skull, specificity of the non-metric features (the two foramina mentale in the lower jaw, the intrusive bones in the sagittal suture, and the Inca bone). The skull merits further extended study. 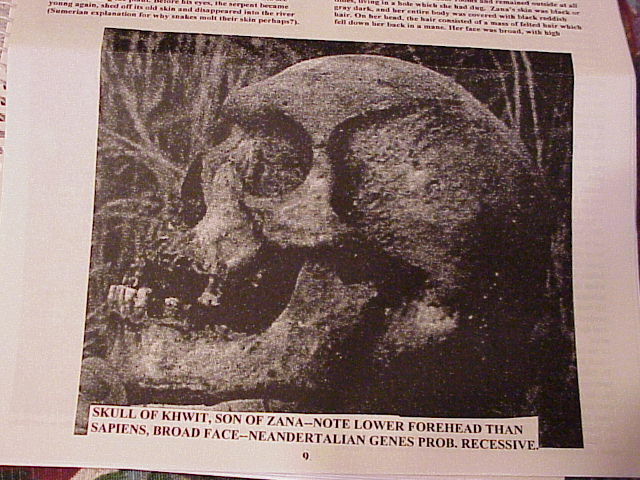 Without Zana’s skull though, it was very difficult for the scientists to come to a clear conclusion as to which species of human she belonged to. To date, they have not performed DNA testing on the bone samples. I had come across this story quite by accident as I had been reading about the occurrence of ‘feral children’ (a pet hobby of mine). Due to my genetics and mild interest in the whole ‘missing link’ mystery I loved this story though there are some things that doesn’t quite add up. Firstly, I would’ve really thought that somebody out there had taken a picture. Wild women aren’t a common occurrence (though some may disagree with me…). And, the family who ‘owned’ her was quite rich. Also, I can’t imagine that nobody (in this day and age) had thought to do some genetic testing on the exhumed skull of her son. But, the story is fascinating. I have this theory that man is incredibly lonely, that we are constantly in search of some indication that we are not alone. 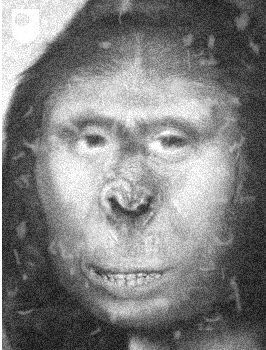 Be it in discovering alien life, or discovering the ‘missing link’ which would link us up to apes (and make us family… of sorts). This tale provides hope in a sense, that there are others out there. I’m not talking of big foot and flying saucers. I don’t trust most any American with a camera (sorry guys) and most recents accounts are all too sensational to be believed. But, there are older tales of ‘wild people’ that roam the east. In genetics, there are some that believe that the Neanderthals moved to the east with the appearance of the more human like homo species. And, if we did not kill them all as a man called Ronald Wright theorised in his book ‘A Short History of Progress’ then, where did they go? We didn’t breed with them – our DNA didn’t match. So, did they just disappear? Or – are they still here? I would honestly like for this tale to have truth in it and – if I had pursued my genetics career – I would’ve gone back to that little village in Abkhazia and dug around in the dirt until I found something.